In the late spring and summer, unusual clouds form high in the atmosphere above the polar regions of the world. As the lower atmosphere warms, the upper atmosphere gets coooler, and ice crystals form on meteor dust and other particles high in the sky. The result is noctilucent or “night-shining” clouds (NLCs)—electric blue wisps that grow on the edge of space. 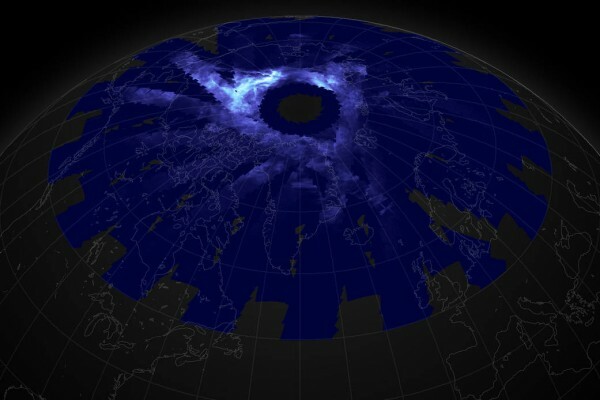 NASA’s Aeronomy of Ice in the Mesosphere (AIM) spacecraft observed noctilucent clouds on June 10, 2015. This image is a composite of several satellite passes over the Arctic, and the clouds appear in various shades of light blue to white, depending on the density of the ice particles. The instrument measures albedo—how much light is reflected back to space by the high-altitude clouds. Noctilucent clouds were first described in the mid-19th century after the eruption of the Krakatau volcano. Volcanic ash spread through the atmosphere, making for vivid sunsets around the world and provoking the first known observations of NLCs. At first people thought they were a side-effect of the volcano, but long after Krakatau’s ash settled, the wispy, glowing clouds remained. In the past decade, AIM has been observing and measuring these seasonal, high-altitude cloud formations. Researchers have found that they are appearing earlier and stretching to lower latitudes with greater frequency. There is some evidence that this is a result of increased greenhouse gases in the atmosphere. Though they were not thick enough to appear in AIM imagery, some noctilucent clouds were visible to ground-based observers in the continental United States on June 9 and 10.